In 1987, great public celebrations were held to honour the three hundredth anniversary of the arrival of Padre Kino in the lands of Pimería Alta: In addition to these meetings, a project was devised to erect “Three Statues for Three Centuries.” A committee of citizens in Tucson, Arizona, sponsored by the Arizona Historical Society, commissioned the renowned Mexican artist, Julián Martínez, who had represented Kino in many other situations, to design and cast three monumental, equestrian statues. They were to be cast with the idea to place one in Tucson, where Kino founded the beautiful mission of San Xavier del Bac; in Magdalena de Kino to honour the place of his burial; and in Segno to honour his birthplace. 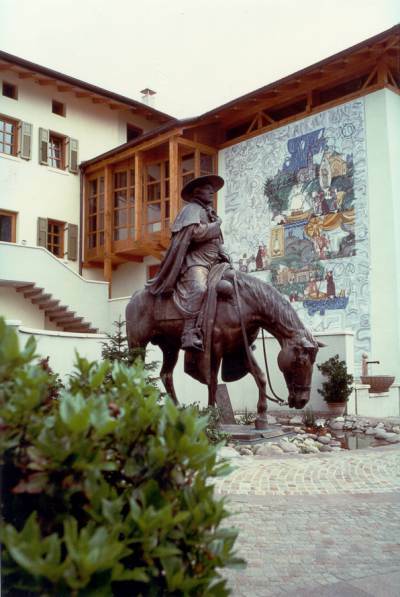 Then, on June 16, 1991, in Segno, before authorities of the United States, and of the states of Arizona, Sonora, and the Region of Trentino, the third statue was unveiled.